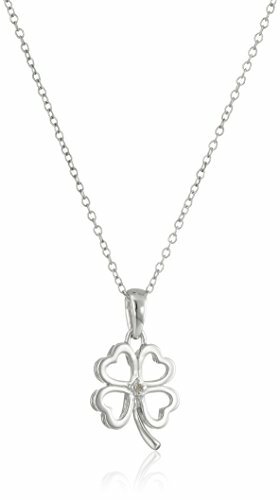 A petite diamond accents adds a little glamour to this dainty four-leaf clover pendant, made from polished 925 sterling silver. It makes a fun gift, or a nice little good luck charm for yourself. The pendant is featured on an 18-inch sterling silver cable chain. The art of trendy design is beautifully echoed in this stunningly elegant necklace. Exquisitely crafted in gleaming sterling silver.Sterling Silver HistoryOriginating in Europe in the 12th century, sterling silver has been a source of value for everything from table settings to currency for centuries. Sterling silver is a soft metal, yet when combined with copper, produces a tough material that could be heavily relied on. Due to these qualities it is the perfect material to mold into intricate jewelry designs, giving a luxurious look at an affordable price.Sterling Silver CompositionSterling silver is created when combining pure silver with copper at a ratio of 92.5 percent silver to 7.5 percent copper to maintain its durability without harming its sparkle.Sterling Silver CareSilver should not come into contact with harsh household chemicals. To avoid scratches, store in a lined jewelry box or pouch, as it is prone to tarnish. Upon noticing any discoloration, use a gentle polishing cloth. Look and feel great with this pendant cable chain necklace. The clover pendant dangles from an 18 inch cable chain. 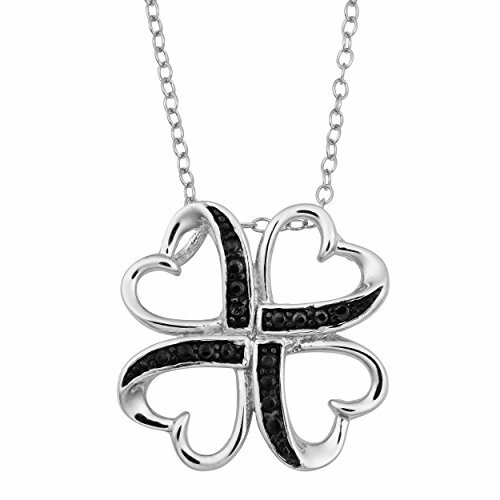 The pendant is crafted of 925 sterling silver with a black diamond accent. The necklace is crafted of 925 sterling silver with the finest standards of workmanship. The 1.3mm links are light yet durable, made just the right size for pendants, and medallions. The stylish jewelry showcases a fine cable design that won't twist or knot like other bracelets or necklaces and features a spring ring clasp for extra-security. This necklace is certain to make the perfect gift for your loved one.We import the chain directly from the manufacturer in Italy. Each chain is stamped 925 and Italy ensuring you we only sell genuine chains of high quality. To prevent any damage we recommend routine maintenance. Clean with warm water, mild soap and a soft brush then rinse thoroughly. Avoid contact with lotions, hairsprays or any other chemicals that may damage the chain. Dry and store in a soft cloth pouch to prevent dulling or scratches. This fine gold Clover Shamrock Necklace showcases the artistry and beauty of our handcrafted fine jewelry. With its simplicity and nobility, this stunning piece of fine jewelry has become one of our bestsellers as it incorporates and represents the doctrine of the Holy Trinity. 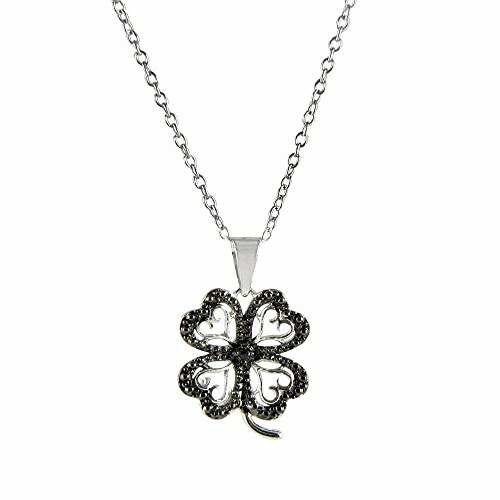 The Clover Necklace is also associated with the Irish tradition, more specifically the celebration of St. Patrick's Day. In many cultures around the world, a horsehoe, kept as a talisman, is seen as a good luck charm. 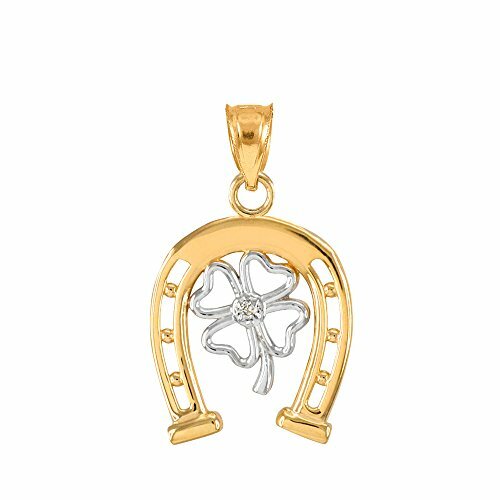 Whether you believe in its bringing of good luck, or you simply admire its luxurious allure, this fine 14k two-tone yellow gold and white gold horseshoe with Irish 4-Leaf Clover Diamond pendant is perfect for you. Adorn yourself or a loved one with this charmingly auspicious horseshoe necklace pendant. 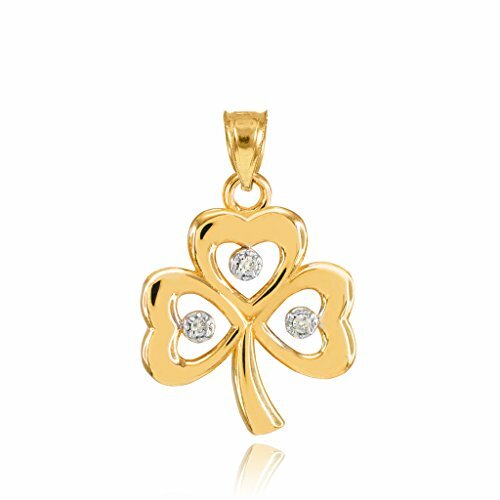 This fine 14k gold Clover Shamrock charm showcases the artistry and beauty of our handcrafted jewelry. With its simplicity and nobility, this fine piece of jewelry has become one of our bestsellers as it incorporates and represents the doctrine of the Holy Trinity. 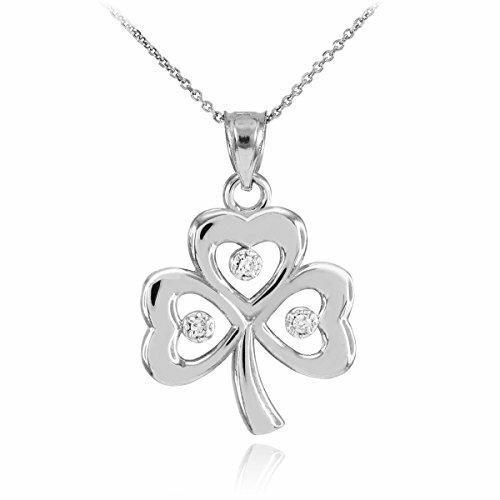 The Clover Necklace is also associated with the Irish tradition, more specifically the celebration of St. Patrick's Day. Enhance any wardrobe with this Clover Shape diamond charm pendant bracelet. This bracelet features sparkling white diamonds set in a clover pattern. It is crafted in 10-karat pink gold with an adjustable cable chain of 16cm + 3cm length extender. Two strands of delicate cable chains extend from either side of the clover shape, adding minimalist appeal. Unique Charm bracelet, true fashion statement. Looking for more Diamond Accent Clover Pendant similar ideas? Try to explore these searches: Cargo Striped Skirt, Hot Chocolate Packets, and Titanium Muffler Sleeve. 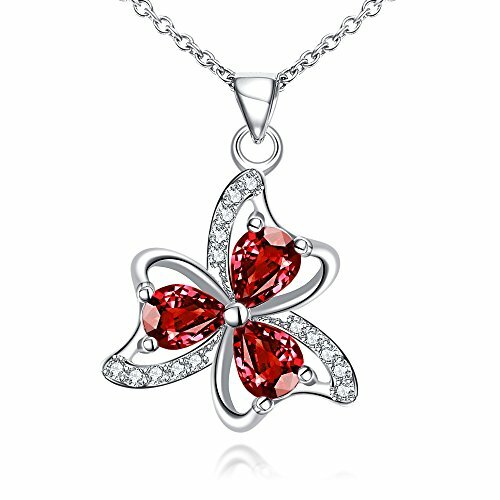 Look at latest related video about Diamond Accent Clover Pendant. Shopwizion.com is the smartest way for online shopping: compare prices of leading online shops for best deals around the web. 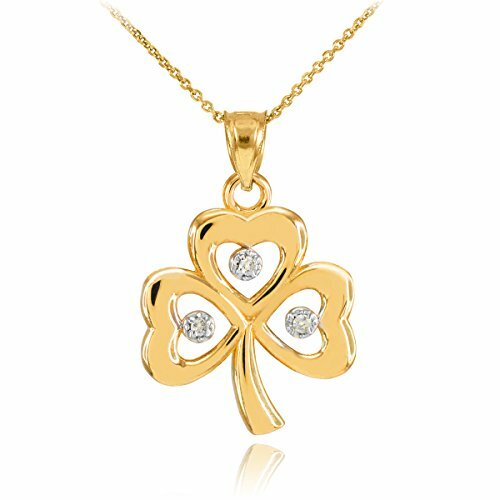 Don't miss TOP Diamond Accent Clover Pendant deals, updated daily.